More of a “why have I not been doing this for years?” post. Remember back when I made caramel sauce? For some strange reason, I haven’t made it since then. I know, right!? The other day, I decided to make caramel sauce. I had no idea what I was going to use it for, but it sounded lovely. And come on, like I wouldn’t be able to figure out what to do with it? I’d also been pouring the leftover coffee into an ice tray and freezing it in the off hand chance I’d have time to make iced coffee. I didn’t have time to cold brew, so I made coffee in the french press, poured it into a pitcher, and let it rest in an ice bath. 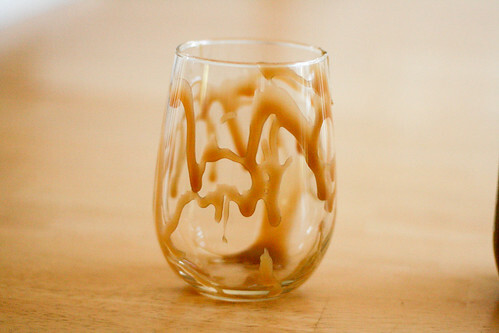 Once it was chilled, I took the caramel sauce and drizzled it in some glasses. then the coffee. 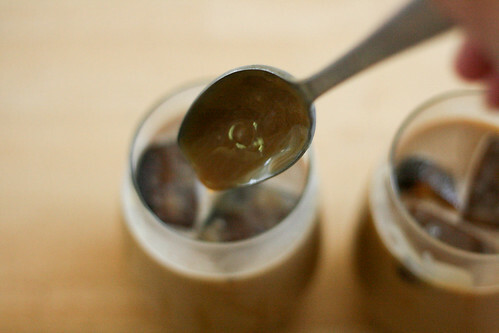 I used the caramel drizzling spoon to give it a little stir, and voila! Lovely. Like Starbucks, only waaaaaaaay cheaper. And closer. To my mouth. Mmmhmmm. 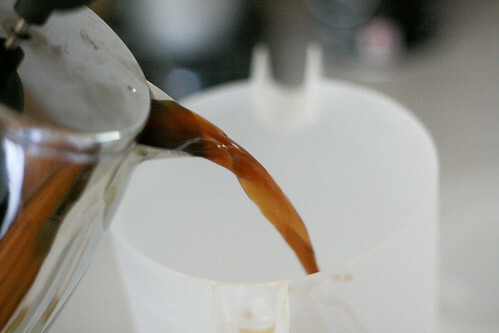 For this batch, I didn’t let the coffee cool enough, so the caramel drizzles disappeared when I poured the coffee in. I got it right the next time, though. 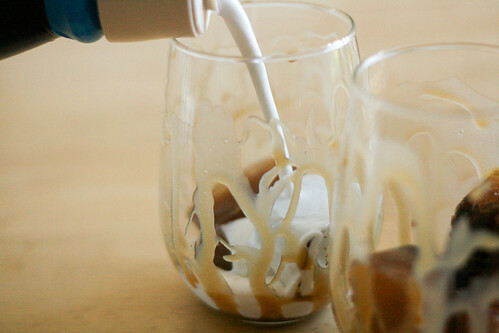 When drank through a straw, you’ll get little caramel bombs of delicious. 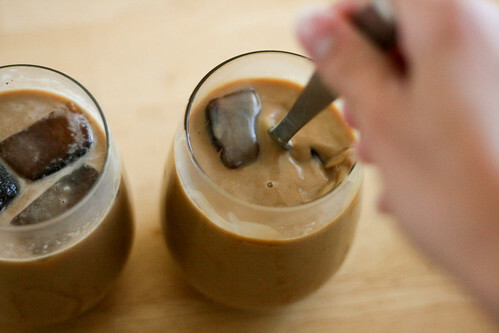 And if you want to be suuuper fancy, blend the coffee, coffee cubes and creamer for a frappuccino. There’s no way you’ll regret that. So, now that I have the power of delicious iced coffee, you’ll find me out in my back yard, chillin’ with a book and sippin’ on love. You should try it too. Then call me. Combine butter, brown sugar, half and half and salt in a saucepan over medium heat. Whisk gently, but pretty constantly, for 5-7 minutes. Add vanilla and cook for another minute or so, allowing the sauce to thicken before removing it from the heat. 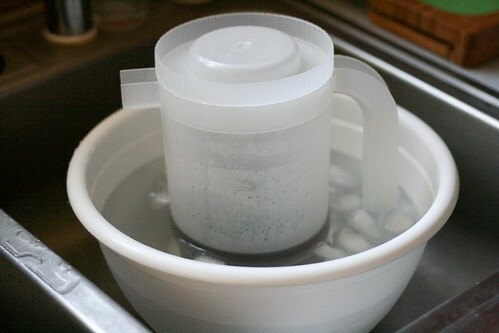 Pour the sauce into a container (glass jars rock) and refrigerate until cold and thick. If you like salted caramel, add in the 1/2 tsp of course sea salt once the caramel is completely chilled, just before serving. Great post by author on Not so much a recipe. Um Venice the post is called “Not so much a recipe” saying Great post is a compliment…duh! whao! recipe or not, i will definitely try it. BTW, what a creative mind to think, imagine and do such stuff. stumbled and i liked it. Looks terrible. Do not want. Too many compiletmns too little space, thanks! 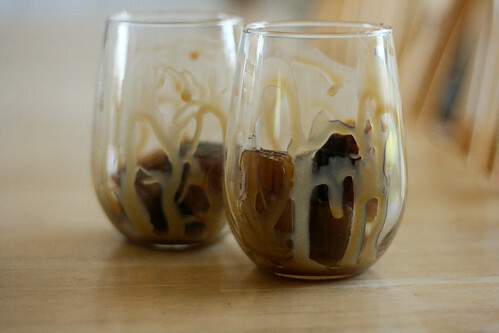 Loving the glasses with the sauce and the frozen coffee idea! I totally need to get on this. I am all about Coffee! This looks amazing. I am so going to try this! That looks PERFECT! Thanks for sharing! These look delicious !Thank you! 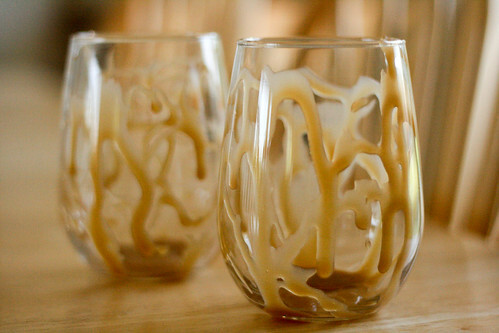 What a fun and creative way to enjoy a cold coffee! Can’t wait to enjoy one myself! Half and Half is half cream and half milk. It’s very rich, but delicious in coffee. I smell brandy…and biscotti…or perhaps savoiardi. 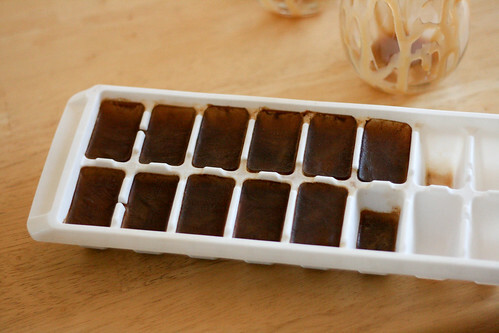 The coffee ice cubes are brilliant 🙂 I haven’t had time to make the caramel until today so I’ve used chocolate sauce… It is delicious! Thank you for sharing. Ooh, chocolate sounds delicious too! What sort of Vanilla in the caramel sauce? Essence? 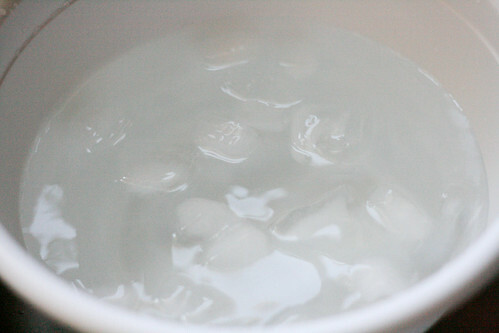 wow really creative way of making a drink.. I need this to spear in my hand NOW…..
It’s too bad it’s 11 oclock at night right now, or I would be in the kitchen ASAP making this. Sounds wonderful! I know what I will be doing tomorrow morning! On the porch early tomorrow, with one of these in my hand. Giving this 5 stars! Mmmmm sounds and looks divine!! Yummy! I love me some good coffee, just not willing to spend 5-7 a cup! (for the small size) That’s astronomically ridiculous! I tried to spice up some coffee, and added some cinnamon and pure coconut milk…mmm. You should try it! Enjoyed reading this post. 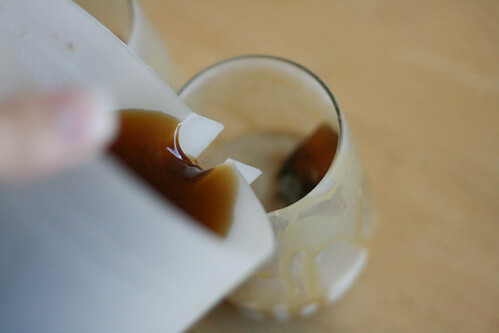 You can taste the flavor of chilled brewed coffee when it’s refrigerated overnight.